Two days before National Migrants’ Day on June 7, Migrante International held a picket protest at the Department of Foreign Affairs to mark the sector’s protest against the worst state of Filipino migrants under the Aquino administration. June 7 also marks the 20th year of the implementation of the Magna Carta for Migrant Workers, or Republic Act 8042, amended by RA 10022, which was enacted in 1995 shortly after the death of Flor Contemplacion. “Twenty years have passed since Flor was executed in Singapore but despite the Magna Carta for Migrant Workers and Overseas Filipinos our OFWs are more beleaguered than they ever were before,” said Sol Pillas, secretary general of Migrante International. “It is just on paper, but in reality, the government does not protect OFWs and services for them are most dismal. Labor export is more intensified under the present administration because OFWs continue to salvage the country’s deteriorating economy. The government has forsaken the lives of OFWs in exchange for remittances and big businesses,” she added. Pillas scored Pres. Aquino’s recent speech in Japan saying that there are less OFWs now than in 2010 owing to a “developing economy”. She said the number of OFWs leaving daily to work abroad has tripled since Aquino took office– from 2,500 daily in 2010, 4,500 in 2012 to 6,000 by the end of 2014 (IBON data). “Because of the Aquino administration’s desperation to further seek job markets abroad due to the country’s worsening economic situation brought about by its unreformed policies, its only recourse has been to intensify its labor export program at the expense of the rights and welfare of OFWs. It has become more clear that the labor export policy is nothing but a big business venture from which the government profits, with OFWs as the milking cows,” Pillas said. Pillas also probed Pres. Aquino’s veto of the Legal Assistance Fund (LAF) for the 2015 budget. In his Veto Message last December 2014, Aquino included the LAF in items in the General Appropriations Act 2015 placed under “conditional implementation” and subject to the approval of the Department of Budget and Management (DBM). The Magna Carta for Migrant Workers requires a P100-million LAF in the national budget sourced from the following: P50 million from the Presidential Social Fund, P30 million from the Contingency Fund of the President and P20-million from OWWA. He said that only an average of P30-million has been allocated for the LAF since Aquino became president in 2010. She also demanded an explanation from the government on why funds for the LAF has been slashed since 2010, while there have been reports that at least P52 million in legal funds for OFWs were unused since 2011. “Kailangang magpaliwanag ni Aquino. Ibig bang sabihin nito pati ang LAF na-DAP (Disbursement Acceleration Program) na?” Pillas said. Only P30-million has been allocated for the LAF since Aquino became president in 2011. She added that based on DFA disbursement reports, the DFA has at least P6-billion unused funds from 2010 to 2013. She revealed that a large chunk of the so-called “savings” were from the “underspent” allocations for the Overseas Absentee Voting (OAV) and the Assistance to Nationals (ATN). This were the same period when the DAP funds were accumulated, Pillas said. 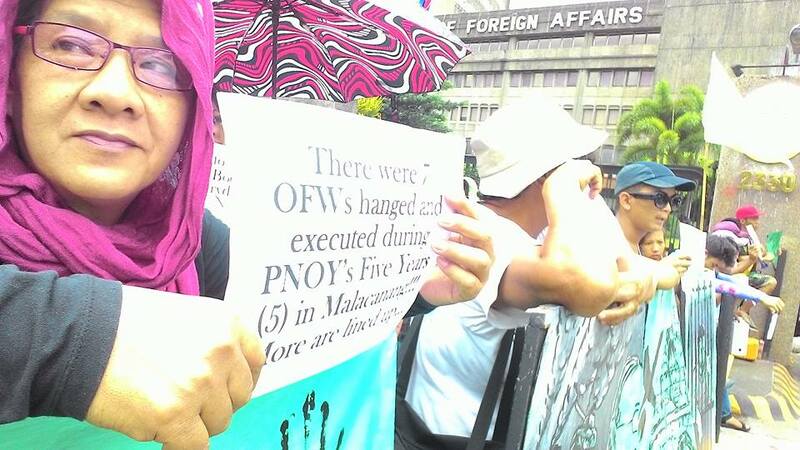 This entry was posted in News and tagged Aquino administration, Department of Foreign Affairs, Magna Carta. Bookmark the permalink.